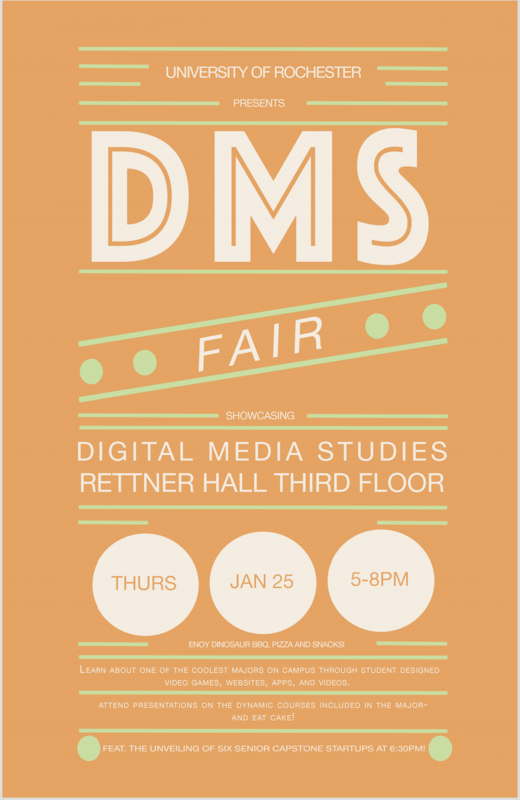 The Digital Media Studies program is starting off his year by taking over Rettner Hall Third Floor to celebrate the DMS major, and you are invited to attend! The first hour or so you can hear about DMS classes, check out student-made video games and other stuff in the brand new Senior DMS lab (Rettner 306), learn about the new DMS minors in the works, and enjoy free pizza and drinks. At 6:30, this year's DMS seniors will present their six capstone projects midway through their creation. Come out and support them and hear about the great work they are doing!